Take the time to learn how iDrive 6.0 operates and integrates with your phone and home devices. That’s the future, folks. The 2018 BMW 5-Series is more than a mid-size luxury sedan. Aside from the hardware that powers the car, helps drive the car, and is the car, the new 5-Series is more about what you don’t see. It's one of BMW's most advanced vehicles. It can park itself without a driver, take pictures of its own surroundings without a driver on hand, can start itself via a mobile app even when the driver's not present–if that's what the driver wants it to do. It also sports some of BMW's most advanced engines and transmissions, whether augmented by battery power or hitched to M-worthy engineering. This year, the 5-Series covers more ground. 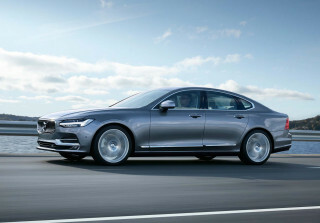 Three models have been added to the lineup, the fuel-saving 530e plug-in hybrid, the long-legged 540d diesel-powered sedan, and the tire-shredding M550i xDrive. A new uber-quick M5 is due soon, but we cover that separately. A tall-riding fastback branded as the 6-Series GT is loosely based on the 5-Series. Regardless of model, the 5-Series takes an evolutionary approach to styling compared to its predecessor. The new 5-Series has a sharper nose and more tapered profile along the sides. The interior will be instantly recognizable to anyone who’s driven a 5-Series in the last decade, aside from the updated tech. The 5-Series can be trimmed in rich leather and increasingly expensive interior materials, although some combinations can be visually distracting. A sharp 8.8-inch LCD screen has been planted in front of the driver inside the instrument cluster, which resolves one of our biggest gripes about the lo-fi screen from the outgoing model. A 10.2-inch touchscreen is perched atop the dash and becomes the nerve farm for all things 5-Series. Aside from the standard infotainment controls, the touchscreen serves as the hub for BMW’s push for connected-car technology, dubbed Connect+. The services range from trip notification to Microsoft Exchange calendar sync, to email and entertainment. It’s an ambitious push for the car company—one that we don’t yet understand—with an eye on the future for self-driving cars. 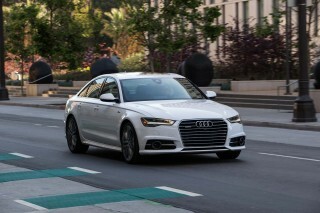 The plug-in hybrid 530e starts at $53,375, including destination, and serves as the de facto entry model when federal rebates are considered. 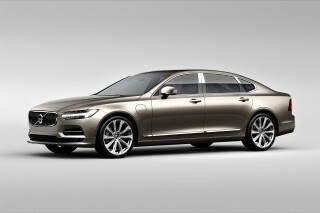 At that price, it’s a worthy entry against the Mercedes-Benz E-Class, Volvo S90, and Audi A6. 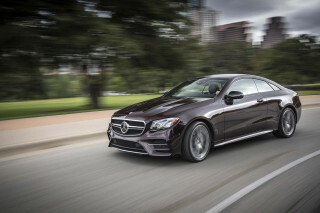 In our limited drives with the 530e, we found the electric motors blended seamlessly with the turbo-4 combustion engine, and its all-electric range reached up around 16 miles in stop-and-go Chicago traffic. Like any modern BMW, not much is included in the base price regardless of engine. Active safety features such as adaptive cruise control, active lane control, and blind-spot monitors can easily tack on $5,000 to the bottom line, and we’ve driven turbo-6-powered 540i models with $25,000 in optional upgrades. A light touch can keep some cars reasonably priced, but maxing out a 5-Series requires a strong stomach. The 2018 BMW 5-Series gets a technophile and a brute added to the lineup this year, but otherwise stays the same. The 2018 BMW 5-Series adds two new models to the lineup this year at opposite ends of the performance spectrum. The new 530e iPerformance plug-in hybrid and M550i xDrive bookend the 530i and 540i models that were carried over from last year. The 5-Series is one year removed from a full makeover, although perhaps that phrase overstates the changes. 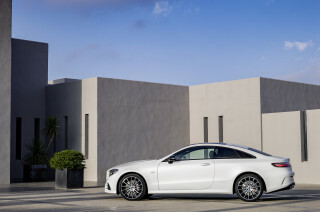 Taking a page from “If it ain’t broke…” the most notable differences from this generation to the last are the pronounced corporate kidney grilles and sharper profile line running down the doors. 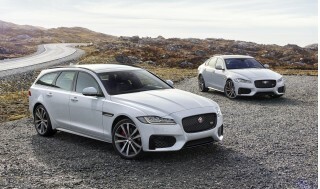 Different models have slightly different lower front bumpers and rear bumpers, the most pronounced and aggressive being reserved for the M550i. The 5-Series borrows liberally from the larger 7-Series, but gets its own details. Creases along the doors under the windows and door handles are reserved for the 5-Series alone, and updated LED taillights and chromed exhaust ports finish the 5-Series off in its own way. Inside, the 5-Series is uniquely elegant; soft-touch surfaces and leather abound. Multiple materials help visually break upper, middle, and lower tiers of the dashboard that can be trimmed with brushed aluminium, wood or glossy black trim. A broad swath of hides can finish the 5-Series’ upholstery, but they’re not all created equal. Rich browns can intersect with light brown piping and diamond quilting, which can look visually distracting. The good news? At dusk or darker, ambient lighting bathes the interior of the 5-Series in dramatic colors that helps tone down any busy interior. Tech will be the focal point for many 5-Series owners, and BMW has tastefully displayed its latest and greatest. The 10.2-inch touchscreen dominates attention in the cabin, but an 8.8-inch LED screen sandwiched between the driver’s instrument cluster and larger head-up display prove far more useful to the task of driving. Every 5-Series has adequate power, but the new M550i xDrive should whet appetites for more to come soon. This year a turbodiesel 540d joins the fray with a 3.0-liter inline-6 cribbed from the X5d. The engine makes roughly 250 horsepower, but its trick is efficiency—provided you've skipped the hybrid version. 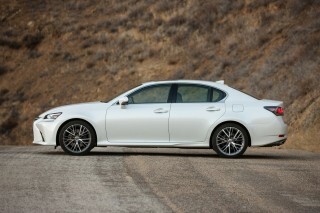 The 540d is available only with all-wheel drive, and it returns 30 mpg combined, according to the EPA. The 2018 BMW 5-Series is exceptionally quiet and comfortable, befitting its luxury price tag. Inside, the 2018 5-Series is largely identical as last year’s version, which is to say, it’s very comfortable. Base models will be fitted with BMW’s synthetic leather, called SensaTec, which is durable and a reasonable facsimile of the real thing, if not wholly satisfying. Opting for real hides adds $1,450 to the bottom line, and should be considered as an essential upgrade—leather is available in more shades including Night Blue, which we think is just the tops. The power-adjustable front seats can be multi-contour affairs, which means we don’t have the math to tell you how many different positions the 20-way adjustable seats can be configured. Heated and cooled seats are optional, same goes for in-seat massagers. Regardless of upholstery, the 5-Series’ bottom cushions can be extended for better thigh support, something our long legs appreciate. With a mix of colors, contrast piping, and quilted pattern stitching, it doesn’t take much to get the 5-Series looking overly complicated. Our advice: walk the lot before landing on a specific color. All seating positions in the 5-Series have exceptional leg room and head room, and we’ve comfortably carried five adults in the 5-Series for several hours. Most sedans will have 18.7 cubic feet of cargo room in the trunk, the 530e’s battery eats into that space and cuts it down to 12.1 cubes. Only the turbo-4s found in the 530i and 530e can hamper the experience. At full tilt, the busy small-displacement engines can buzz into the cabin, but the harshest noises are kept out with plentiful sound-deadening material. The new 5-Series is a Top Safety Pick+ and federal testers should follow soon with their ratings. Not all the safety data for the 2018 BMW 5-Series is in, but what’s available is good so far. 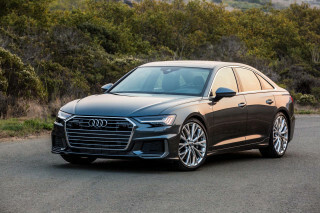 The IIHS gave the sedan a Top Safety Pick+ award, its highest rating, for acing its crash tests and offering advanced safety features that can mitigate, or prevent a crash. This year, BMW has made available on more cars its advanced safety features that can prevent crashes or even drive the car for less than a minute, and made standard a rearview camera that was optional last year (it’s a federal requirement this year). When equipped, the 2018 BMW 5-Series includes blind-spot monitors with rear cross-traffic alert, pedestrian detection, forward-collision warnings with automatic emergency braking, and lane departure warning. Additional packages can add adaptive cruise control, active lane control, a surround-view camera system, and side collision warning. Those additional systems can drive the BMW for more than 30 seconds without driver input, before warning the driver to resume control of the car. Beyond those advanced systems, the 5-Series comes equipped with a standard set of front and rear airbags, including seat-mounted side curtains, seatbelt pretensioners, and a telematics service that will notify first responders if the car has been in a severe crash. All that adds up to peace of mind for drivers and owners, although it can add several thousand dollars to the bottom line. Typically, we’d like to see those features be standard on most cars like similar offerings from Toyota, Nissan, and other automakers, but those are the exceptions for now, not the rule. Most automakers have signaled that standard automatic emergency braking is a few years away. Last year, BMW improved its head-up display to be larger and offer more information including navigation information. It’s a useful feature that’s bundled into a driving assistance package that includes parking sensors. Optional M Sport brakes can arrest the 5-Series quickly, without noticeable nose dive or squirming. Buyers looking at the package may not consider its safety potential first, but it’s a bonus feature bundled into bigger binders. The 2018 BMW 5-Series steps closer to a future for cars that was hard to imagine just five years ago. In base 530i configuration, the BMW comes standard with 17-inch wheels, a moonroof, power-adjustable front seats, dual-zone climate control, 8.8-inch digital instrument cluster display, LED headlights, synthetic leather upholstery, Bluetooth connectivity, and a 10.2-inch touchscreen for infotainment. Aside from some package shuffling and a standard rearview camera, the 5-Series is largely the same car it was last year. The options list is healthy and long, and can add tens of thousands to the bottom line of any 5-Series model. 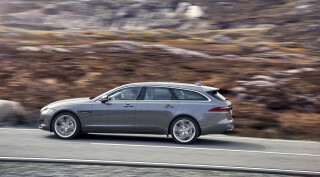 - A newly coined Premium Package adds entry-level luxury conveniences such as heated seats and exterior chrome accents. - Two levels of driving assistance add confidence to safety features, or semi-autonomous driving features that can pilot the car for less than a minute. - The latest version of BMW’s infotainment system, iDrive, incorporates wireless CarPlay, which is hugely useful. The bad news? Opting for the slick CarPlay system requires adding BMW’s expensive navigation system. - At $4,200 the Bowers & Wilkins stereo might be the most expensive boombox on the planet, but it happens to travel in one of the nicest packages. From there, the BMW 5-Series can be infinitely customizable with sport appearance features, uprated brakes, a head-up display, bigger wheels (all the way up to 20-inchers on M550i xDrive models), nappa leather, and beautifully polished wood. The new 530e and M550i xDrive models feature 17- and 19-inch wheels respectively, while 540i models get 18-inchers as standard equipment. BMW’s 5-Series is also something of a technological flagship for the company with their iDrive 6.0 infotainment system. Beyond the typical functions, BMW offers a connected-car suite of applications that can manage your calendar, update others on your drive, schedule service appointments, buy BMW accessories, even monitor your car’s surroundings via a 360-degree picture taken with the car’s camera and beamed to your smartphone. It’s hard to overstate the possibilities BMW is exploring with its Connect+ services; the automaker recently announced a partnership with Microsoft to serve users with Exchange Sync data and other services. We struggle to imagine where BMW will go in the near future, but it’s clear that they’re considering the future when drivers won’t drive at all and will need something to do when a 5-Series (or something very like it) is chauffeuring drivers around town. The 2018 BMW 530e iPerformance is all of the performance with better fuel-economy than the rest. What’s not to like? For 2018, BMW added a plug-in hybrid 530e iPerformance to the 5-Series range that dramatically improves its fuel-efficiency and potential. It won’t impact our scores—yet. Although the 530e is a de facto entry model (it’s the least expensive after applicable state and federal rebates are considered) the 530i is still the one we’re likely to see on roads most often. Opting for the turbo-6 in 540i models does not significantly penalize mileage. 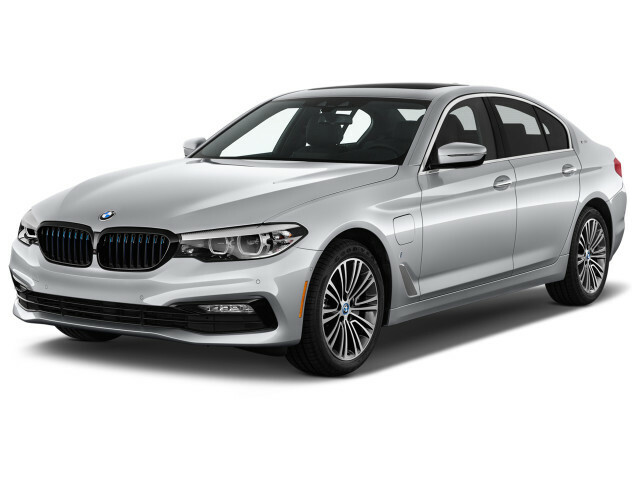 The EPA rates rear-drive 540i models at 21/30/24 mpg and all-wheel-drive versions at 20/29/23 mpg. All 5-Series sedans use a slick-shifting 8-speed automatic and turbocharging to extract every ounce of energy from its gas tank. The efficiency champ even uses batteries to go further. The 2018 BMW 530e iPerformance is rated up to 29 mpg combined, or 72 mpge, which factors a full battery and gas for combined travel. The all-electric range is somewhere around 16 miles, depending on driving conditions. The 9.2-kwh battery can be recharged in under three hours with the 7.2-kw onboard charger. 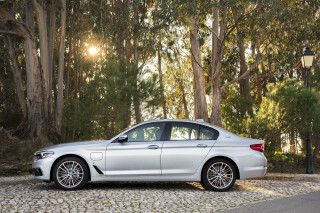 The BMW M550i xDrive is rated 16/25/19 mpg and the diesel-powered 540d manages 26/36/30 mpg.